For 3 votes against zero, the former president Luiz Inácio Lula da Silva had his sentence maintained in the second instance by the Federal Regional Court of the Fourth Region (TRF4), which rejected the defense’s arguments regarding the lawsuit’s nullity. The session, which began around 8:30 am was closed at 5:45 pm. The former president’s defense argument, among other elements, that the absence of proofs that convict Lula in the Guarujá triplex apartment case is outstanding throughout the sentence in first instance, which would make it null, once “guilt was not proven, but only innocence”. This was one of the arguments rejected by the court of appeals and rapporteur João Pedro Gebran Neto, the first one to vote, who followed the Fact Domain Theory, meaning that even if there is no proof of the accusations, Lula would have to be convicted for passive corruption and money laundering charges due to his position as the president of the Republic. The remaining court of appeal judges, Leandro Paulsen and Victor Luiz dos Santos Laus, followed Gebran Neto’s vote, which increased the conviction from 9 years and 6 months to 12 years and 1 month in incarceration. Popular movements, unions and other social segments are protesting throughout the country and promise to keep the demonstrations going. After the rapporteur reading - the court of appeals judge Gebran Neto -, the defense attorney Cristiano Zanin used the floor to question the vote. As one of his answers, the judge reaffirmed that the attorney could file a motion for clarification to that very same court afterwards. Since the vote was unanimous (3 x 0), there is no possibility of filing a motion for reconsideration, which would then attempt to change the sentence. After the conclusion of the proceedings at the Federal Regional Court of the 4th Region (TRF4), there is also the possibility of a rejection by the Supreme Court of Justice (STJ) and an extraordinary appeal to the Federal Supreme Court (STF). In both cases, the defense can request that president Lula respond in freedom, as well as ask for the Clean Records Law (Lei da Ficha Limpa) not to be applied, according to the terms of the Article 26. Another point to be made is that, if Lula is convicted, two questions need to be answered. Since the Supreme Court contradicted the Constitution and was favorable to the maintenance of the sentence with imprisonment after the second instance resolution, there is the chance that the former president will be incarcerated. Besides the political cost, there is a tendency for this interpretation from the Supreme to be reviewed. The second point is the ineligibility. A conviction by the court of appeals, however, does not prevent Lula from being candidate and appeal to superior instances, such as the Superior Electoral Court (TSE) or even the Federal Supreme Court (STF). Gisele Cittadino, professor at the Pontifical Catholic University (PUC) from Rio de Janeiro, and member of the Brazilian Front of Jurists for Democracy, summarized Lula’s political and legal situation. “This coup, in order to be consolidated as coup, will have to be considered a coup and suspend the electoral process in 2018. Because even if president Lula is convicted here, he is still candidate until the 15th of August,” she says. Therefore, only from that date on, August 15th, that corresponds to the scheduled date to register all the candidacies, can an impugnation process be filed, which takes place in another court, from the Electoral branch. According to the Brazilian Front of Jurists for Democracy, in a Q&A article for Brasil de Fato on the case, only after five days of the candidates’ registration can Lula’s candidacy impugnation be requested based on the Clean Records Law. “The Superior Electoral Court will go through their own rites, which include, in respect to broad defense rights, a number of hearings and analysis of proofs, so that it can be decided if there are enough reasons to stop the defendant from running the elections. Specialists understand that, even if there is full agreement in the judicial instances in order to define the electoral scenario for the 2018 elections, and the deadlines were shortened between the decision (that would make Lula ineligible) and the appeals, including in the Supreme Court, the case would probably not be tried before October. 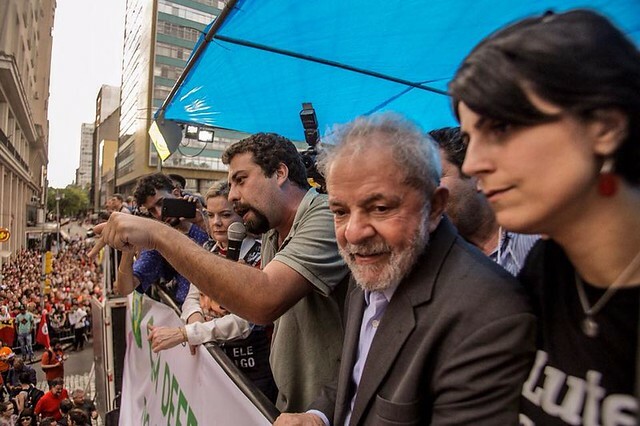 During this time, Lula should remain a candidate in the campaigns”, said the jurists.